Welcome to our Resort of the Month Secrets Puerto Los Cabos Golf & Spa Resort. This feature is particularly unique because Liz and I went on a site inspection with the lovely events coordinator there, Leslie Chavez. She took us around the property highlighting some beautiful options for a destination wedding. 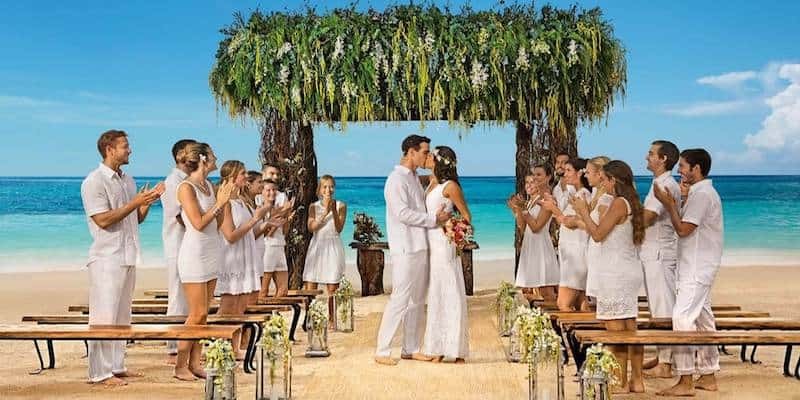 Today, we are going to give you 9 Wedding Facts About Secrets Puerto Los Cabos. Did you know that the most popular time to get married at Secrets Puerto Los Cabos is April, May, and June according to Leslie? What I love about this area is that the weather is always going to be beautiful, so if you want to have a little more privacy or come during a low season, you are still going to have a stunning wedding here. When you see the wedding gazebo, you will understand why brides love it so much. The palm trees, flowers, and the ocean in the background create a beautiful backdrop for your ceremony. The area can also fit a maximum of 200 people. However, Leslie told us that even with 90 people, you have plenty of space for chairs. Leslie was telling us that 80% of the weddings that they have here are Americans, about 12% are Canadians, and the rest is Mexican. 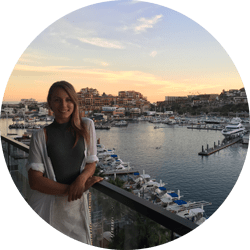 What is so great about flying to Los Cabos is that if you have guests flying from the West Coast, the flights are short and direct. So, Leslie was telling us that she always recommends to her brides that they have their wedding ceremony an hour and a half before the sun goes down. That way, you have plenty of time for your celebration, and when you go to take pictures, the sun will be setting. I am obsessed with this terrace. It was being rebuilt at the time of our visit so I couldn’t capture the entire area, but it was a large, free-standing terrace, directly on the beach. They can fit up to 100 people, with a bar, dance floor, and is very private. I would highly recommend this location! Furthermore, Leslie took us around to all of their garden and beach options for a destination wedding. What I loved about the idea of having a reception at one of their gardens is she was saying they can get creative with the decor. She explained that in the past they had put lights in the palm trees to create a very romantic setting. They have plenty of space for bands, a bar, and close to the main lobby. You will find that resort chains such as Secrets have great wedding packages depending on your budget. Individual packages will include everything you need to make things a little bit easier when it comes to your location, decor, food, and drinks. You can look at them in more detail here, but Leslie also told us if there is something that you want to be upgraded, such as chairs, they have great partners to find exactly what you want! She is so accommodating and wants to help make your dream wedding a reality. Leslie took us to the large indoor ballroom where they can host weddings and provided linens (whatever colour you want). She said it isn’t as popular of choice but can still be done. What I liked about it is that if you’re going to have an ample space inside to decorate, this location would be perfect. So, after the reception, if the wedding guests are still wanting to keep the party going, they have a lounge with a DJ available. There is a bar, dance floor, and is perfect for the guests looking to celebrate. It’s open from 10:30 pm until 1:00 am. Also, it’s close to the garden reception options so you won’t have to walk far! Overall, this massive resort is a magnificent place for a destination wedding. One thing that I didn’t mention was the excellent Spa and Golf options for your guests. The spa is fully equipped with a bridal suite, and the golf course surrounds the resort. So if you are looking for a beautiful and fun place for your wedding, these 9 Wedding Facts About Secrets Puerto Los Cabos hopefully convinced you that this is resort might be the perfect location! Did you like 9 Wedding Facts About Secrets Puerto Los Cabos? Check out more here!